Multi-instrumentalist: oud, saz, Brazilian percussion (maracatú, other rhythms from Pernambuco, various forms of samba), body music, bass, Middle Eastern percussion, and more. 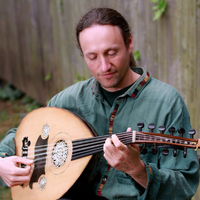 10 years studying North Indian classical music on the oud and voice interwoven with 15 years studying Brazilian music and dance (including 5 trips to Brazil for a total of 1 year of training) have given Derek a unique approach to music, rhythm, dance accompaniment, improvisation, movement, teaching, and life. Derek is available for performances, dance collaborations, recording sessions, teaching, licensing, live accompaniment (films, plays, classes, etc), acting, and many other creative possibilities. He is also a certified practitioner and instructor of BREEMA (a bodywork method bringing body and mind together in harmony) and incorporates embodied mindfulness into his teaching and playing.